Amidst the currently contested conceptions of democracy, a review of Michael Schudson’s The Rise of the Right to Know: Politics and the Culture of Transparency. Cambridge, MA: Harvard University Press (2015). 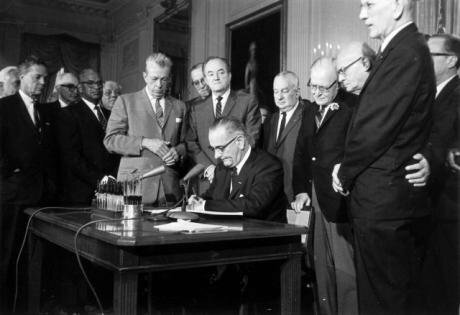 July 2, 1964 file photo, President Lyndon Johnson signs the Civil Rights Act in the East Room of the White House in Washington. The Democratic Study Group played a crucial role in securing the legislation. Despite all the talk of ‘sovereignty’ and the ‘will of the people’, perhaps the most striking feature of Britain’s fevered debates about Brexit is an absence of any real questioning of the meaning of democracy itself. Engagement with the idea of democracy is typically cut short by framing our politics in terms of a tension between ‘democracy’ and ‘liberalism’, or even more starkly between ‘populism’ and ‘technocracy’, whereby a politics of rights to be exercised against government is set against a politics of popular sovereignty, or, in Barnett’s formulation, rights and regulation appear as a ‘fourth branch of government’. But this might be a false dichotomy. If ‘democracy’ is set against ‘liberalism’, what are we to do with (among other things) the ‘right to know’? It is clearly a right to be exercised against government, and thus seems obviously ‘liberal’. But it is also typically identified as democratic, and supports the democratic goods of accessibility of information, participation, and association. If there is a problem here, it is a problem at the level of contested conceptions of democracy. Michael Schudson’s fascinating book The Rise of the Right to Know: Politics and the Culture of Transparency (2015, Harvard University Press) charts a detailed legislative history of the emergence of norms, practices, and legal instruments of transparency. Yet the way that he emphasises the democratic ambivalence of transparency and situates it in a debate about the transformation of democracy makes this book surprisingly relevant to our current political situation. In 1968, while preparing to run for President against Richard Nixon and Lyndon Johnson, George Romney, Governor of Michigan, released his tax returns to the public, showing his sources of income, charitable contributions, and tax deductions. Nixon and Johnson did not follow suit, but since 1976 every presidential candidate, with the partial exception of Gerald Ford, has released at least some of their tax returns. Every presidential candidate, that is, until Donald Trump. Much has been made of the fact that Trump paid no political price for waving away demands for disclosure. But less attention has been paid to how remarkable it is that such a norm of transparency became established in the first place. The usual story begins in the late 1960s and 1970s, after a succession of revelations of governmental abuse of public trust, including the secret history of the Vietnam war leaked by Daniel Ellsberg in 1971, the Tuskegee syphilis experiments on African Americans exposed in 1972, and, of course, the Watergate break-in and cover-up, the ur-scandal of the modern era. The turn towards transparency might thus be seen as a response to public pressure and as an attempt to win back trust. Like a family in therapy, so the American polity would bring its secrets into the open and work through its issues, and would come away with a new, more mature relationship based on mutual trust (this was the view of Senator Frank Church, who headed the 1975 Senate investigations into covert intelligence activities). If that was the intention, then it didn’t quite work out. When in 1958 the American National Election Study began asking people if they trusted government to do what was right, 57% said ‘most of the time’ and 23% said ‘some of the time’. By 1970 those answers were almost equal, and from 1974 to the present those trusting government ‘most of the time’ have been firmly in the minority. While we probably know more today about what political authorities are up to, and hold them to higher public standards, trust has not returned to the levels of the mid-1960s. But a more important problem with this story is that the timing does not quite fit. As Michael Schudson argues in his fascinating history, many of the changes we associate with transparency were either in place or in train well before the 1970s. The scandals of the 1970s, he suggests, were a product of a press culture that was already less deferential, and had already shifted from ‘writing down what political leaders said to contextualizing what they said and did’, ‘putting a premium on the stories behind the stories’ (145). The grip of political elites on the sorts of stories we tell about political life had already begun to loosen. The Freedom of Information Act, which gave any person the right to request information from governmental agencies, was passed in 1966 but had its roots in a long campaign by John E. Moss, a low profile California Democrat, against the secretiveness of officials at increasingly powerful executive agencies. The Fair Packaging and Labeling Act, which forced disclosure of information by companies to consumers, was also passed in 1966. It is to Schudson’s credit that he dwells on this dimension of transparency. It is too often forgotten that when Louis Brandeis wrote that ‘sunlight is said to be the best of disinfectants; electric light the most efficient policeman,’ he was referring to industry, not government. The timing of the emergence of transparency matters. If the key changes happened earlier, then public protest and civil society played a different role than often thought. Indeed, Schudson points out that the main drivers of change were often low-profile legislators and policy wonks. Consider the Democratic Study Group, a forum in the House of Representatives for moderate and liberal Democrats founded in 1959, whose symbol was ‘a red-caped crusader, a knobby-kneed, glasses-wearing young man with a big Superman-style “S” on his T-shirt, holding a legislative bill in one hand and a briefcase in the other’ (114). The democratic study group led the drive to reform voting rules in the Committee of the Whole in the House of Representatives. This change was as consequential as it was obscure. The Committee of the Whole is a procedural fiction that enables a smaller group of members to stand in for the whole House and deliberate on a measure and vote on amendments. Since it could be quorate with just 100 members (rather than the 218 required in the House), it was an efficient device for getting things done. But it had the feature – which it originally borrowed from the UK – of not recording individual votes. The ‘unrecorded teller vote’ in the Committee of the Whole was like an invisibility cloak that could be wrapped around the House of Representatives to hide who put the knife into which legislative amendments. This secret vote – which kept journalists and the public from knowing which representative enabled or obstructed the appropriation of funds for the anti-ballistic missile programme, anti-pollution measures, and desegregation – remained in force until 1970. The secret vote in the Committee of the Whole was a bone of contention to reforming liberals throughout the 1950s and 1960s because liberal legislation was routinely blocked by southern Democratic committee chairmen (chairs were appointed on seniority, and because of chronically uncompetitive elections in the South, the longest serving members typically represented Southern states). Schudson takes us deep into the detail of the framing of the Legislative Reorganisation Act, focusing on the figure of Richard Conlon, a former journalist who joined the DSG in 1968 and did much to make the cause of procedural reform salient to the press (no easy task). The point of the story, however, is that the DSG was not motivated by the idea of opening up Congress as such. They wanted to pass liberal legislation, and to do this they needed to know who was blocking it. The side effect was to further entrench a norm of transparency in democratic politics. Even more nerdy is the story of the emergence of the National Environmental Policy Act (NEPA), which required government agencies to prepare environmental impact reports and make them available to the public. NEPA mandated disclosure of information, but this was not disclosure of what had already been done, as with the Freedom of Information Act, nor disclosure of something in process, as with revealing votes in the Committee of the Whole, but rather ‘disclosure related to actions that government agencies planned to undertake in the future – actions that might be modified or entirely prevented because of the disclosure’ (182). This had the radical effect of opening up the federal bureaucracy to legal challenges from those interested in the environmental effects of administrative actions. The crucial part of the legislative text - the part that became the ground for many thousands of subsequent legal cases and thereby also contributed to the growth of environmental law and ecological science – was the demand that 'the environmental impact statement itself should be made public’ (214). This was a late addition to the legislation. Attempting to find out who was responsible for it, Schudson delves deeply into accounts of the principal actors, including Democratic Senators Henry ‘Scoop’ Jackson, Edmund Muskie, and Gaylord Nelson, but he comes up empty handed, and this in itself tells a story. The fact that the authorship of the public participation element is so unclear shows at the very least that the bill’s authors 'spent little time debating the merits or the mechanisms of involving a broader public’ (218). In many ways Schudson’s history of legislative and procedural reforms in the 1950s and 1960s could not be further from today’s anxious talk of populism, mass politics, protest, rogue leaders and their tweets. He clearly enjoys the small and often unnoticed details that turned out to have huge consequences, and in the stories of the ‘second lieutenants’ (270), the unheralded mid-level lawmakers and policy advisors who feature in his narrative. And he finds poetry in the wording of the Freedom of Information Bill, which declared that ‘any person’ has standing to make a request: This ‘is a richer, more universal, and more complete rendering of democratic equality than the founders ever endorsed’ (63). In another sense, however, this book feels very current, in that it describes the emergence of a democratic politics recognisably like our own: one in which power is more networked than sovereign, in which elections, parties, and formal representative institutions claim less and less legitimacy, and in which there are more avenues for public participation in the policy process. Popular power is expressed less in terms of positively agreeing a coherent programme of collective action, and more in terms of limiting in myriad uncoordinated ways the capacity of government to act. Schudson is right to observe that this amounts to a radical shift in the character of liberal democracy, which has been variously described as ‘post-representative’, ‘advocacy’, ‘monitory’, and ‘counter-’ democracy. Schudson’s addition – and a phrase that will surely not catch on – is ‘trans-legislative democracy’. Schudson regards the rise of the right to know as, on balance, a deepening of democracy: ‘for all the hazards and shortcomings of transparency, its expansion has made our politics more worthy of the name “democracy”’ (5). Yet even if we agree, we must ask: Who has been empowered in this shift? Schudson implies that the main beneficiaries have been ordinary citizens. Yet we might worry that the new avenues for participation and influence are mostly taken up by the wealthy, attentive, and well-organised. The period since the 1970s has seen not only the growth of governmental transparency, but also an enduring shift in patterns of wealth inequality, and we are entitled to at least ask whether this is a coincidence. This leads to a further question: If you don’t like the results of this new sort of democratic politics, what are you supposed to do about it? In a ‘trans-legislative’ democracy, characterised by the rise of the regulatory power of the unelected, how do you throw the bums out? It could be that in Trump and Brexit the voters have given their own answer, responding to a vague sense of a loss of control by seeking to wield untrammeled executive power in the name of the ‘will of the people’. Yet if the shift towards ‘trans-legislative’ democracy is deeper and more enduring, we will need new ways to think about progressive reform. Schudson – writing before the political upheavals of 2016 – concludes that we should stop and think how lucky we are, how unlikely and liberating the emergence of a culture of transparency has been. A different lesson suggests itself today. Schudson implies that the right to know is like a ratchet, which only turns in one direction: once the people acquire these rights, they will be hard to take away. Yet they might prove to be far more precarious and fragile achievements, subject to erosion and outright attack. More fundamentally, the issue raised by this book is about the meaning of democracy. It suggests that running underneath debates about Brexit and sovereignty are not the themes of populism versus technocracy, but rather two different conceptions of what democratic reform can realistically mean in our time and place. On the one hand, revitalizing democracy means demanding sharper and clearer party competition and a concentration of sovereign power such that electoral politics really can make a difference (this is the view held by some left-wing supporters of the UK leaving the EU). On the other hand, it involves the dispersal of power through rights-based empowerments, enhanced transparency, localism and the expansion of opportunities for participation. The real question is whether, and if so how, these different democratic practices might work together.